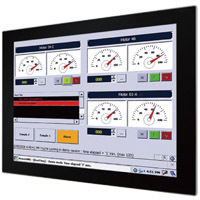 We extend S-Series product line by offering HMI with 15” screen size to satisfy the demand for larger screens in building or industrial automation. It features ultra-low power consumption, and replaceable 2.5” SATA Drive. With PoE onboard it can transfer both the data and electrical power, resulting in a reduction of installation costs and power consumption. In addition, true flat surface is easy-to-clean and designed to avoid clogged dust and water on the edges.